Summary: Everyone thinks their parents are embarrassing, but Hannah knows she's got them all beat. Her dad made a fortune showing pretty girls--and his "party" lifestyle--all over the Internet, and her mom, who was once one of her dad's girlfriends, is now the star of her own website. After getting the wrong kind of attention for far too long, Hannah has learned how to stay out of sight...and that's how she likes it. Of course, being unknown isn't helping her get noticed by gorgeous, confident Josh, who Hannah knows is her soul mate. Between trying to figure out a way to get him to notice her, dealing with her parents, and wondering why she can't stop thinking about another guy, Finn, Hannah feels like she's going crazy. She's determined to make things work out the way she wants....only what she wants may not be what she needs. Oh hurray! Another Elizabeth Scott book to add to my happy collection :). I have been waiting to read this book! Looks good. Please enter me. This sounds so light-hearted & fun! 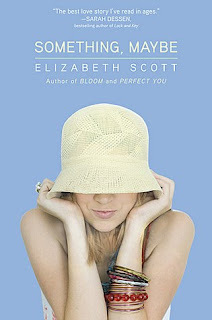 Love Elizabeth Scott-please enter me! Count me in! Looks like a fun book. I really want to read some of Elizabeth Scott's work. Please enter me! Sounds hilarious - I like Elizabeth Scott's books a lot! I have heard so many wonderful things about Elizabeth Scott's books and would love a chance to read this. I've heard nothing but good things about Elizabeth. cool another elizabeth scott book! Heard great things about this one. I kind of feel like a robot. The only thing I can say about all the books you're giving away is "I want this book!" and I really do, so thank you very much! I've heard such good things about Elizabeth's writing. I would love this to be my first read of hers. Please enter me! Thank you. http://ThisBlondeReads.wordpress.com is a great way to contact me. Thanks. This has been on my TBR list. Please enter me! Thanks! Sounds like an interesting read. Please enter me. Oooh I've been really wanting to read this one for a long time! I know everyone says this, but this book sounds great! I just love these kind of books. It sounds like it has a lot of promise. With a Sarah Dessen recommendation it must be good. sounds amazing, would love to win!